KEY FEATURES: Annual herb to 1m. RHIZOME short, thick, yellow and aromatic. 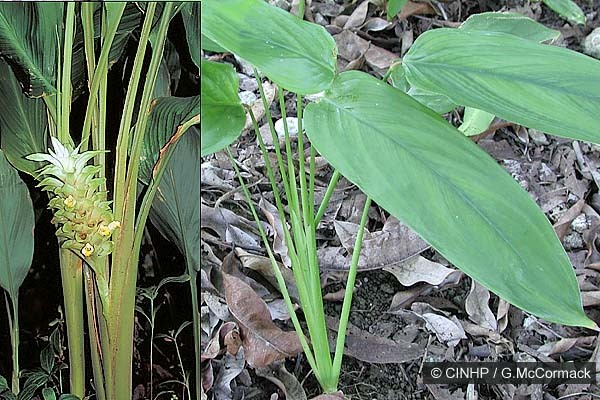 LEAVES stalks form erect pseudostem, blades narrow-oval, to 50x20cm. 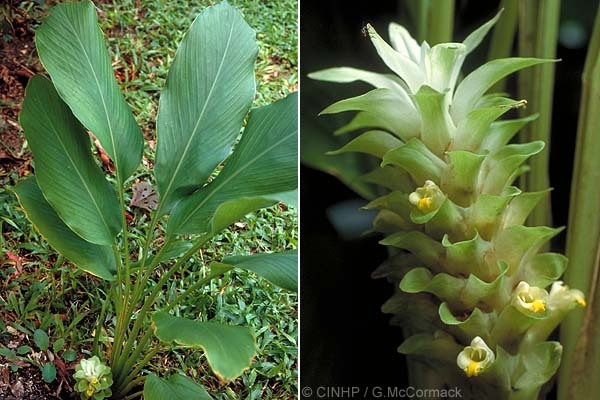 FLOWERS cone-like cluster, to 12cm; bracts pale green with 1-2 white to yellow flowers, terminal bracts pink (and sterile). GENERAL NOTE: In Hawaii the raw root juice was used to make yellow tapa, while the steamed root provided a deap orange dye for tapa. It was also used for medicine and in religious cemermonies. In India is is a major ingredient of curry powder, and the orange powder can be used for adornment.